For a period of 18 Months from the date of purchase, KJ Controls will replace, without charge, controls and accessories which on our examination prove to be defective in material or workmanship. This non-transferable warranty is valid only if the unit has not been used or tampered with by unauthorized or unqualified personnel, misused, abused or improperly installed and has been used according to any instruction’s and/or ratings supplied. 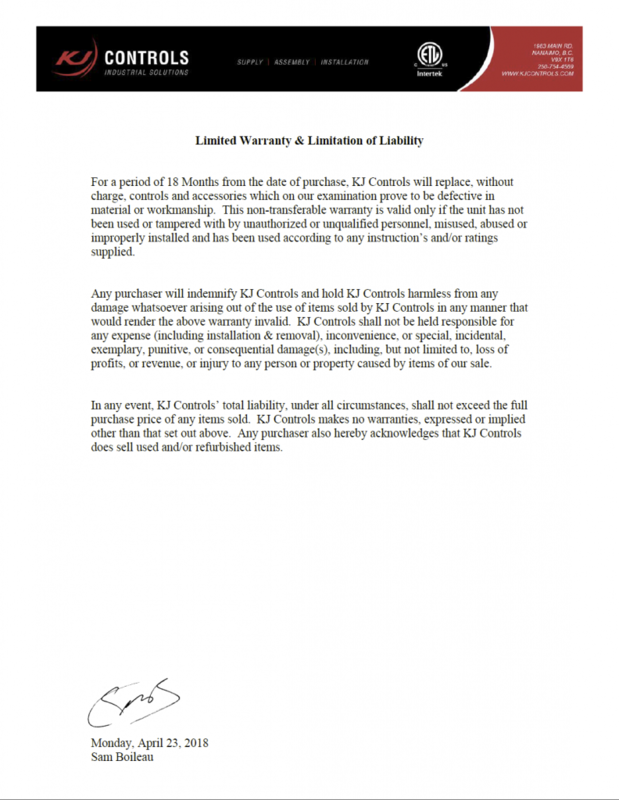 Any purchaser will indemnify KJ Controls and hold KJ Controls harmless from any damage whatsoever arising out of the use of items sold by KJ Controls in any manner that would render the above warranty invalid. KJ Controls shall not be held responsible for any expense (including installation & removal), inconvenience, or special, incidental, exemplary, punitive, or consequential damage(s), including, but not limited to, loss of profits, or revenue, or injury to any person or property caused by items of our sale. In any event, KJ Controls’ total liability, under all circumstances, shall not exceed the full purchase price of any items sold. KJ Controls makes no warranties, expressed or implied other than that set out above. Any purchaser also hereby acknowledges that KJ Controls does sell used and/or refurbished items.